Pilgrim Church traces its roots back to Adelaide's early Wesleyans and Congregationalists. A Wesleyan chapel in Pirie Street was opened in 1851 and became known as the Pirie Street Methodist Church. Stow Memorial Congregational Church, in Flinders Street, was dedicated in 1867. The two churches were back-to-back and were divided by a high stone wall with a locked gate. 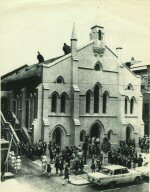 During the 1960s the two congregations began a dialogue which led to a decision in 1969 to become "Union Church in the City", and the gate was unlocked! The name was changed to Pilgrim Church with the inauguration of the Uniting Church in Australia. Meanwhile, during the early 1970s, the Adelaide City Council decided to compulsorily acquire the Pirie Street property and the church building was demolished. All that remains is the former Pirie Street hall, which the Council hires out for meetings. When the Pirie Street Church was demolished significant memorial plaques, stained glass windows, wood panelling from the pulpit and the large organ were moved to the Stow Church building, along with the people. First Congregational Chapel built on North Terrace. Present Church being constructed in 1867. Rear of Stow Church (now Pilgrim) in the 1970s.